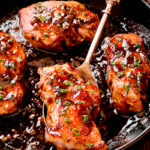 Honey Balsamic Pork Chops - What's In The Pan? Honey Balsamic Pork Chops are juicy and tender boneless pork chops that are seared and coated in a mouthwatering honey balsamic sauce. The sauce is perfectly smooth thanks to Dijon mustard and is packed with flavor from fresh rosemary and fresh thyme. I was inspired to make yet another Pork Chop recipe, this time with Honey and Balsamic vinegar, that play very well together. The natural sweetness of honey balances perfectly with the moderate, natural acidity of the balsamic vinegar. These Honey Balsamic Pork Chops will be perfect with roasted asparagus, green beans or potatoes! Make sure to use a good heavy skillet here, such as cast iron and make sure it’s a large one too. I used 12 inch Lodge Pro-Logic Seasoned Cast Iron Skillet in this recipe – it’s well designed, has a helper handle and sloped sides – very sleek looking for cast iron! Generously season 4 thick pork chops with salt, pepper and Italian seasoning Add 1 tbsp olive oil and 1 tbsp butter to the hot pan until bubbly. Add pork chops and sear on each side for 3 minutes on medium high heat for a total of 6 minutes. Make sure to not go over 6 minutes since we will be reheating the pork chops in the sauce later on. Remove pork chops from the pan. Prepare herb/garlic scallion mixture by mixing together fresh thyme, fresh rosemary, chopped green scallions and garlic. This mixture is what will infuse so much flavor into the sauce! Add 1 tbsp butter to the now empty pan and add chopped scallions, garlic, fresh chopped rosemary and thyme. Cook for 2 minutes on medium heat. To make Honey Balsamic Sauce, add 2nd tablespoon of butter, 1/4 cup balsamic vinegar and 1/4 cup honey and cook until well incorporated, approximately 2 minutes. Now add 2 tablespoons of Dijon mustard – this will thicken the sauce. Taste the sauce and season with salt, if necessary. Add pork chops back to the pan and reheat them, spooning the sauce all over. Honey Balsamic Pork Chops are done! Honey Balsamic Pork chops are juicy and tender boneless pork chops that are seared and coated in a mouthwatering honey balsamic sauce. Pork Chops. Generously season 4 thick pork chops with salt pepper and Italian seasoning Add 1 tbsp olive oil and 1 tbsp butter to the hot pan until bubbly. Add pork chops and sear on each side for 3 minutes on medium high heat for a total of 6 minutes. Make sure to not go over 6 minutes since we will be reheating the pork chops in the sauce later on. 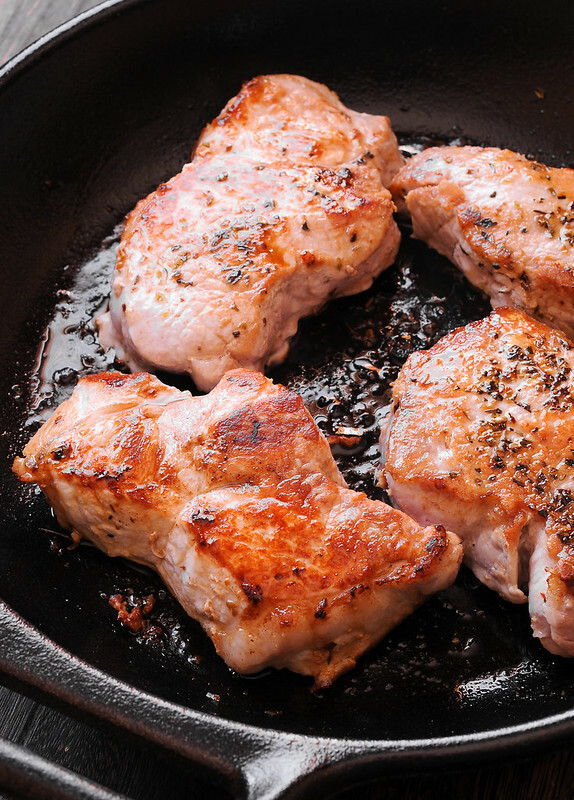 Remove pork chops from the pan. Honey Balsamic Sauce. Add 1 tbsp butter to the now empty pan and add chopped scallions, garlic, fresh chopped rosemary and thyme. Cook for 2 minutes on medium heat. Next, add 2nd tablespoon butter, 1/4 cup balsamic vinegar and 1/4 cup honey and cook until well incorporated, approximately 2 minutes. Now add 2 tablespoons of Dijon mustard - this will thicken the sauce. Taste the sauce and add salt, if necessary. Assembly. Add pork chops back to the pan and reheat spooning the sauce all over. Serving Suggestion. Sprinkle with freshly chopped scallions and serve with roasted asparagus, potatoes or fresh salad. Brianna, thank you so much for leaving your kind comment and I am so glad you enjoyed it. Is it worth marinating the chops overnight? It’s not necessary for this recipe. Made these tonight, very nice. Different taste, welcome change. I will definitely make again. Happy to hear that you liked these! Made for dinner last week. Every child loved them. That’s all 5. Some had seconds. Will certainly make again. Good alternative to dry boring pork chops. What kind of honey did you use? I have natural honey at home. Will that work? It was regular pasteurized honey. Natural honey will do good here as well.